The idea seems logical as legislatives changes adopted in Hungary and Poland are worrisome. But will the EU funding conditionality tackle the root of the problem? Ramona Coman and Nathalie Brack have a standpoint. Ramona Coman is the director of the Institute for European Studies, Université Libre de Bruxelles (ULB). Nathalie Brack is a professor in political science at ULB. On 2 May, the European Commission presented a broad overview of its budget proposal for the post-Brexit era (2021-2027) to the European Parliament. Several issues caught the media’s attention, amongst which the audacious proposal to condition EU funding on the respect of the rule of law. This proposal arose as a consequence of the fruitless political dialogue about the rule of law that the Commission has engaged in with the Polish government these past few years. For the Commission, which has shown great creativity since 2010 by setting up various tools before triggering Article 7, this new form of conditionality could be a more efficient tool than, for example, the new rule of law setting created in 2014. The new proposal to condition the allocation of funds on the rule of law enjoys significant political support in France, Germany and the Netherlands. Unsurprisingly, even though Juncker has specified that he wasn’t targeting any country in particular, this proposal has been condemned by the parties in power in various Central and Eastern European states such as Czech Republic, Hungary, Poland or Romania. The legislative changes adopted in Hungary and Poland in the past few years are worrisome and require careful consideration at the European level. Indeed, if they have been adopted by democratically elected and highly legitimate governments, they certainly do not reflect the mutual trust that member states need and upon which European integration relies. It is therefore not surprising that these domestic changes have triggered various reactions from the Commission, which has tried to have a constructive and productive dialogue with the Polish government. But without much success, as Frans Timmermans, the Commission vice-president, repeatedly stressed before the European Parliament. It only seems logical that this has caused the Commission to search for additional pressure tactics. The idea of conditioning the allocation of funds with respect for the values of the EU could be justified by the fact that the funds are supposed to contribute to the realisation of the goals and values of the EU. How, then, could funds be allocated to a government which rejects the very idea of a multicultural Europe and wishes its country “to remain the way it was 1100 years ago”? Shouldn’t the funds be suspended if they feed corruption or if they are distributed based on national political considerations? Yes, but… will this form of conditionality tackle the root of the problem? This seems rather doubtful, and for several reasons. The first one relates to the decision-making process of such measure, as the Commission’s proposal must be passed by the Council and the Parliament. Historically, states are very reluctant towards any type of strengthening of the Commission as a political institution. Those who followed the 2013 debate on the structural funds reform will still remember that the adoption of the macroeconomic conditionality had only been added to the 1303/2013 regulation after long negotiations between the Council and the European Parliament because the latter was mainly against this Commission’s proposal supported by France and Germany. It can, therefore, be expected that the conditionality based on the rule of law will also require long political negotiations, and without any guarantee of success. Second, the sanctions themselves would require the building of majorities and alliances, which would again delay the impact of these measures but could also make the debates meaningless if it takes too much time. Finally, this new form of conditionality could enter into force by 2021. In 2021, Viktor Orbán will probably be campaigning for his fourth mandate. Until then, he will have had the time and legitimacy to make in-depth and quasi-irreversible changes to the nature of the Hungarian political regime (as he himself announced after his election on the 8th of April). Is it wise to wait until 2021 to take action? How can the Union work with states whose governments try to legitimise the establishment of an illiberal democracy? 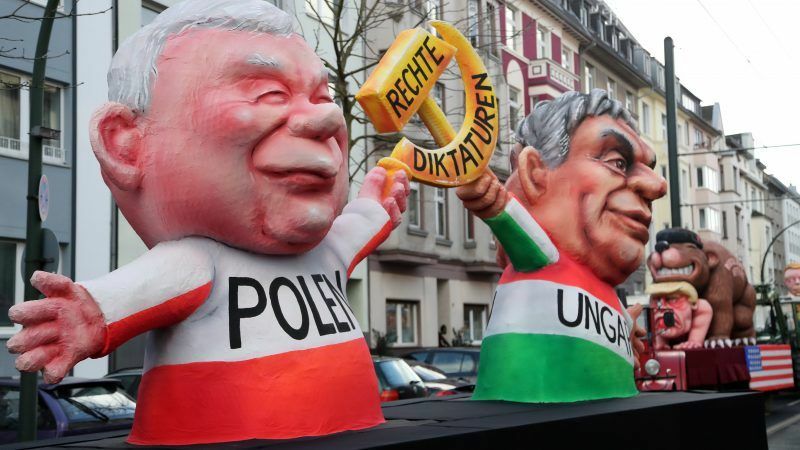 The lack of reaction on the part of the EU toward the Hungarian and Polish reforms has incidentally given rise to many backlashes, thereby putting the legitimacy of the Union in question. Let’s not forget that the sanctions will penalize the citizens and regions of the unruly states, and it’s precisely those citizens and regions that need support (notably through EU funding). Although proposal seems like a good idea at first sight, the Commission should be more ambitious and, more importantly, more innovative in order to counter the democratic drawback of certain states. It could already start by using the existing tools (such as OLAF) to make sure the EU funds reach the citizens. A special fund for the promotion of the EU’s values and of the rule of law in the new financial planning of the EU could prove interesting. All the while keeping in mind that multiplying the number of tools risks making the decision-making process more complex and cumbersome, but also, more importantly, jeopardising the EU’s credibility.